This time we need the real boss. 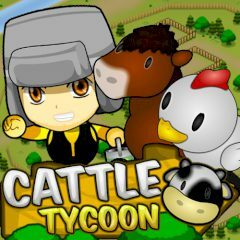 Cause the main task of this game is to think strategically and develop your ranch. You have a lot of plants and animals, so sell products and make the real business. Are you already fascinated? Then go! Have you ever dream to have your own ranch? Then this game is for you! You will raise animals, sell products made in the farm to customers and manage your business like a boss! So, just play as a rancher and your objective is to sell the cattle as much as possible to make yourself richer. In this game you have to think how to get a lot of cows, sheep, ducks and chickens to sell here. So, breed the livestock in the barn and make them bigger and healthy to sell with the best price. Is everything clear? Then play this game!